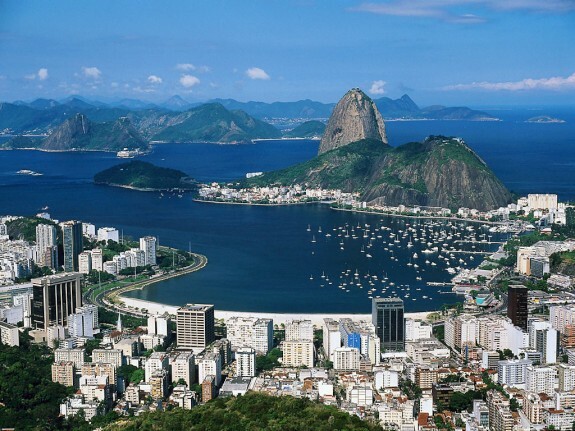 Blog from Rio de Janeiro, Brazil | Where is the Love? We made it to Rio safely. The flight was long, it stopped in Sao Paulo (further away than Rio!) first, and then the baggage and immagration lines were large and uncontrolled. Almost saw a fight in the airport when we jumped in to the line in front of people. We managed to turn down several very enthusiastic taxi drivers outside the airport who informed us it was four hours on the bus to Copacabana. and that he would take us in 2. We waited an hour in the heat for the "air conditioned" bus which was only 1 1/2 hours and a quarter of the price! Anything to save a bit of cash. The hotel was fine, clean with very hard beds and breakfast served in your room. Rio was spectacular. We mastered the local bus service and made our way to Urca to get the cable car up Sugar Loaf Mountain (famous from the James Bond film). We went up about 4pm and stayed to watch the sunset over Rio. Quite a sight as you can see from the photos. 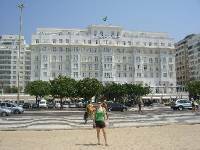 The next day we wandered along Copacabana beach, watching some beach soccer and volley ball as we went. We are just going to miss the Fifa Beach Soccer World Cup, which starts on Thursday. We jumped on another bus through the city to the Corcovado and got the train up through the national park to see Christ the Redeemer. The view over Rio from there was amazing. Brazil are celebrating winning the right to stage the World Cup or Copa Monde in 2014 and there was a party at the top for tv cameras. Lots of green and yellow wigs and flags. We are due to leave at 9am on Wednesday so we missed the flamengo soccer game at the Maracana statium. We will just have to come back and see Scotland in 2014! We met up with our tour tonight. There are only 5 of us just now. We ate at a price by kilo Brazilian restaurant (lots of rice, beans and meat) and had a few drinks at the beach front. So far so good! 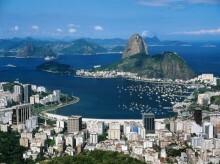 We start our trip in the morning (31st) first op Ilha Grande, South of Rio.